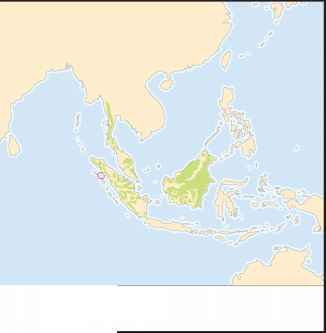 The highly fragmented distribution of broadbills is limited to tropical and subtropical sub-Saharan Africa, Himalayan India, Thailand, Cambodia, Vietnam, extreme southern China (also Hainan Island), Borneo, Sumatra, Java, peninsular Malaysia, and the Philippines. Smithornis and Pseudocalyptom-ena are the only genera occur in Africa. Hose's broadbill (Calyptomena hosii) and Whitehead's broadbill (C. whiteheadi) are restricted to Borneo and the Mindanao and Visayan wattled broadbill (Eurylaimus steerii and E. samarensis) are restricted to a few islands in the Philippine archipelago.